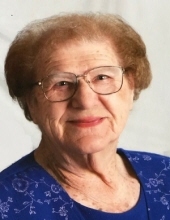 Rosella Ella Erina (Niemeier) Grefe of Plymouth, age 91, died April 3, 2019 at the Heritage Care Center in Fairbury. Rosie was born November 6, 1927 at Beatrice, grew up in the Plymouth area, and graduated from Plymouth High School in 1945. She met the love of her life on a bus ride from Lincoln to Beatrice while traveling home for the holidays in December 1947. She married Alwin Grefe on June 19, 1949 at Immanuel Lutheran Church of rural Plymouth. The marriage was blessed with four daughters, one of whom was stillborn. They established their home on an acreage 2½ miles southeast of Plymouth where they lived for 55 years. She was a member of Immanuel Lutheran Church of rural Plymouth until it closed in 1984 and then was a member of Zion Lutheran Church of Harbine. She was also a member and former secretary of the Historical Society of Jefferson County. She was a cook for the school cafeteria at Tri County Schools for over 30 years. She and her husband acquired the Niemeier heritage farm of 1881 east of Plymouth and were honored with the Aksarben Pioneer Farm Family Award in 1989. Family time was important to Rosie and Alwin and they loved taking family trips to neighboring states while the children were growing up. Years later, Rosie, Alwin, Barbara, and Karen took several family trips to Germany to visit relatives. In 2004, they moved into Plymouth. She enjoyed cooking, baking, reading, gardening and collecting bells. Survivors include three daughters, Linda Grefe of Fairbury, Barbara Ruhnke (Donald) of Fairbury, and Karen Reynolds of Plymouth; four grandchildren, Stephanie Wetter (Bruce) of Washington, Kansas, Tim Reith (Kendra) of Minden, Curtis Reynolds of New York City, and Krista Reynolds of Plymouth; two great-grandchildren, Abigail and Mckenzie Reith; three step-grandchildren, Joshua Ruhnke (Lisa) of Lincoln, Jacob Ruhnke of Jansen, and Amber Pliefke (James) of Garland and seven step-great-grandchildren; nieces and nephews. She was preceded in death by her parents, Carl and Charlotte Obering Niemeier; her husband Alwin, who died September 6, 2018; an infant daughter, Mary Lee; two sons-in-law, Wayne Reith and Jeff Reynolds; one sister, Alma McLaughlin; one brother, Werner Niemeier; three sisters-in-law, Dorothea Grefe, Vera Duensing, and Evalina Palmer; three brothers-in-law, Hilbert Duensing, Robert McLaughlin, and Elmer Palmer. Funeral services will be held at 10:30 am on Monday, April 8, 2019 at Zion Lutheran Church of rural Harbine with Rev. Matthew Koterba officiating. A family prayer service will be held at 10:15 am in the church basement on Monday. Burial will follow at Immanuel Lutheran Cemetery east of Plymouth. A memorial has been established to the family’s choice. The body will lie in state at the Fox Funeral Home of Plymouth on Sunday, 12:00 noon until 8:00 P.M. and at the church one hour preceding the service on Monday. The family will meet and greet relatives and friends on Sunday from 6:00 p.m. – 8:00 pm at the funeral home. www.foxfuneralhome.net Fox Funeral Home of Plymouth is in charge of the arrangements. To send flowers or a remembrance gift to the family of Rosella Ella Erina (Niemeier) Grefe, please visit our Tribute Store. "Email Address" would like to share the life celebration of Rosella Ella Erina (Niemeier) Grefe. Click on the "link" to go to share a favorite memory or leave a condolence message for the family.